What Day Of The Week Was January 3? 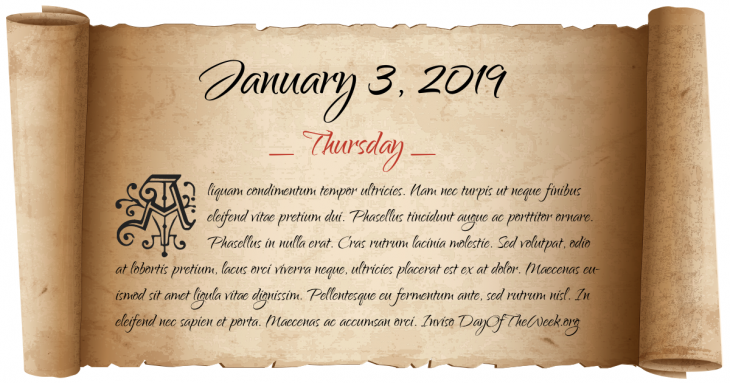 January 3, 2019 was the 3rd day of the year 2019 in the Gregorian calendar. There were 362 days remaining until the end of the year. The day of the week was Thursday. The Perihelion, the point in the year when the Earth is closest to the Sun, occurs around this date. A magnitude 7.7 earthquake destroys the city of Almaty in Russian Turkestan. Popular Canadian-American jockey George Woolf dies in a freak accident during a race; the annual George Woolf Memorial Jockey Award is created to honor him. Frances P. Bolton and her son, Oliver from Ohio, become the first mother and son to serve simultaneously in the U.S. Congress. Who were born on January 3?